The rental market is tough these days, especially in big cities. You have to scan the classifieds, jump on opportunities, and be ready to say yes at a moment's notice. So the last thing you need is for some landlord to refuse you a lease because of questions he or she is actually not allowed to ask. Here are 10 of those questions. Getting asked any of them should give you pause. It may be an innocent enough question, especially if you have an accent and the landlord picks up on it. But it's actually against the Fair Housing Act to ask questions regarding someone's nationality. A landlord cannot ask about your parents' nationality or upbringing either, or your spouse's. This is all information that should have no bearing on your application, or your suitability as a tenant. If a landlord does ask, the penalties can be severe. 2. Have You Ever Been Arrested for Anything? 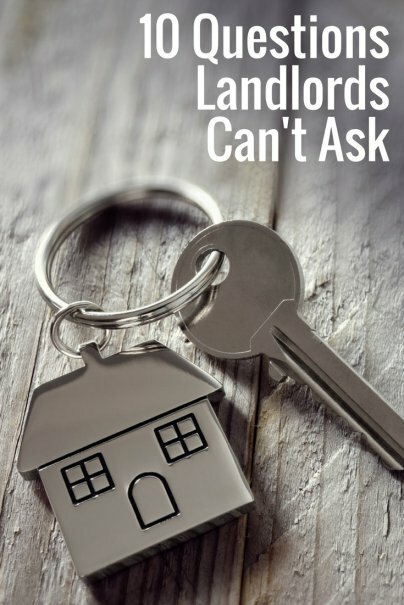 If a landlord is asking this, they're probably trying to protect themselves from someone who could be trouble. But, landlords are simply not allowed to know about your arrest record. They are entitled to know if you were convicted of a crime, and that will come up on a standard background check. However, since innocent people can be arrested and then set free, landlords aren't entitled to arrest records. 3. Are You Straight, Gay, or Bisexual? This has absolutely no place in the conversation, and cannot be asked by the landlord. It's a direct violation of the Fair Housing Act, and by doing so, the landlord could face severe penalties. If sexual orientation ever becomes an issue, know that it's a violation of the law. Many landlords may be genuinely looking out for you here. They may know that the wheelchair access to the building is very poor, or that it would be a tough building for a blind person to negotiate. That is all well and good, but it's not their concern. Someone with a disability has the same rights to rent a home or apartment as an able-bodied person. What's more, every apartment or home up for rent should be made available to a disabled tenant. If the landlord steers you to one particular apartment over all others, they could actually face legal action. When it comes down to it, a person's disability, even if it's severe, cannot be brought into question when renting. It's also worth pointing out that pet policies do not apply to service animals. 6. So, Do You Go to Church Around Here? Once again, this may seem like an innocent enough question, but probing about your religion is a direct violation of the Fair Housing Act. The landlord may not mean anything by it, but the assumption could be made that he or she is favoring Christian applicants over all others. Perhaps the landlord is biased for, or against, Muslims or atheists. None of this should have any impact on your application. Your faith, or lack thereof, is your concern, and yours only. Should any question about religion come up, the landlord is breaking the law. You have to wonder why that would be any concern of the landlord. After all, married people do not necessarily make for better, or worse, tenants. Some married couples are model citizens, others fights constantly and may appear on an episode of Cops. But none of this is relevant anyway, because the landlord is not allowed to ask you anything about your marital status. Even a statement like "I see you two are engaged," which may be prompted by seeing a ring, is not kosher. You do not have to answer this question, and the landlord asking it could get in trouble for doing so. 8. Are You On Welfare? A landlord has every right to ask about income. After all, they need to know that you can pay the rent on time, without any trouble. But where you get that income — that's different. If you are on welfare, receive food stamps, and get other kinds of benefits or public assistance, you can keep that information to yourself. The landlord cannot pry, and cannot deny anyone tenancy based on that information. If he or she does, it's cause for an investigation by the local authorities. Seems like a standard question, right? And most rental applications have a "date of birth" section for you to fill in. But, asking about your age is another one of those protected pieces of information covered in the Fair Housing Act. It's quite possible a landlord wants to rent only to people in a certain age bracket. This is against the law. The only time age can be introduced as a factor is if your application is for a senior community or retirement home. Other than that, it's a no go. 10. What Race Are You? Similar to the nationality question, this is a huge violation of the Fair Housing Act. Even if it's posed as a compliment, (like "You have beautiful olive skin, are your parents Greek or Spanish? "), the landlord is stepping way over the line. No questions about your race can be asked, and if it comes up, you can report the landlord for discrimination. Have you ever been asked any of these questions? How did you respond? I was wondering, can a landlord ask for references? Or the name of their current or former landlord? Or their current employer? My sister has been burned several times by people trashing her rental before they stopped paying rent and were evicted. Unfortunately this article is slightly misleading. There are exceptions to this as outlined in other areas, including HUD. A landlord may ask age, marital status etc but can not discriminate based on this. While it may be better to not ask this question, any normal, reasonable landlord isn't going to discriminate based on the answers. A disabled person may see the rental but the tenant may be responsible for the cost associated with the tenants certified ability i.e lowering counter tops etc as well as placing money into an escrow to put the rental back into original state. The landlord isn't required to put in an elevator to the basement etc. To bad the article is one sided and misleading as it could have been a very informative article for both parties. Thanks for pointing this out. All true. Plus, we put it in our leases the number of adults and number of children who will be residing in the unit. How are we supposed to put that in the lease if we don't ask how many kids they have. It makes no sense whatsoever that we should not know how many people will be living our rental units. I did not know. Honestly, in my city all of those laws go out the window - and you'd have to take your complaint to their counterparts in Fair Housing, who'd claim to be unaware of American customs. Names and ages of children are included on rental application as landlord needs to know how many people will be living in unit. Number of tenants can be limited based on size of unit. Age of children is not legal. Number of tenants, yes, age isn't. In New York City, you must know ages of any children in order to comply with laws covering window guards (11yrs or under) or lead paint (5yrs or under). Also there are overcrowding limits based on unit size (sq.ft.formula). Additionally how would a landlord know his true liability in a claim if he doesn't even know how many ppl were occupying an apt? Every addl illegal occupant costs money: lost rent, extra water costs for toilet, bathing, etc. And how would a landlord perform his due diligence in protecting existing tenants from potential tenants whose backgrounds have not been checked? The article seems to have been a "one set of rules fits all cities" - too generalized, needed more indiv.examples from across the country. Maybe used as a starting point but not as THE basis for all cities. I am not sure where this writer got his information but it is necessary to ask many of these questions in the course of reviewing an application to evaluate qualifications. If you are not asking any questions then there is no screening being done. It is ok to ask for information but you cannot discriminate based on race, familial status, disability or other fair housing issues. If you do not ask about marital status then you may turn someone down on financial means by not including the spouses income. The same goes for children as adult children may have income needed. We ask for information so that we can make an informed decision not to discriminate.